Private Bass Guitar tutoring lessons Satellite Beach, FL. Check out some of our most popular teachers near Satellite Beach, FL including Melbourne, Palm Bay, Rockledge, Merritt Island and Indialantic. I've been teaching bass guitar for over 12 years now in a variety of different styles. Some styles include, but not limited to: rock, metal, funk, blues, pop and more. I like to work on various techniques and playing styles so that my students develop their own unique approach and can incorporate many different styles into their own playing. I began playing the bass in high school. I played the guitar first for a few years, then I became a bassist in a funk band. I am a fan of slap bass, but I can teach you to use a pick to if desired. Hi there! I'm Matt. I'm a composer, lyricist and playwright. I have been playing piano and guitar for over 12 years professionally as a session musician and solo artist. I am a graduate of Marymount Manhattan College (BA), Hunter College (MA) and the BMI Musical Theatre Workshop. alous Husband Returns in Form of Parrot (with Nathan Brisby, dir. Tom Wojtunik, SoundBites Festival: TheatreNowNY), The Coincidentals (with Emma Jeszke, The Pitch: Finger Lakes Musical Theatre Festival), How's This Sound?! (The Duplex; multiple sold-out runs), The Adventures of Manny McDougal, and Zombie Friend. My original material has also been featured at the Detention Series (Primary Stages), Tune in Time (The Triad Theatre), The Metropolitan Room, 54 Below, The 2012 and 2017 Annual Gala (The Duplex), Pianos, The Bowery Electric, Rockwood Music Hall, The 45th Street Theatre and Arlene's Grocery. I have also competed in over ten national video game jams as a composer and sound designer. My experience was phenomenal, i learned so much in only 45min!!! I recommend take lessons to everyone, I guarantee you will love it as much as i do. I approach each element as it applies to the appropriate instrument. I am looking forward to advancing your knowledge and understanding of music and how it applies to what you are hoping to achieve in your studies, be it for work or pleasure. 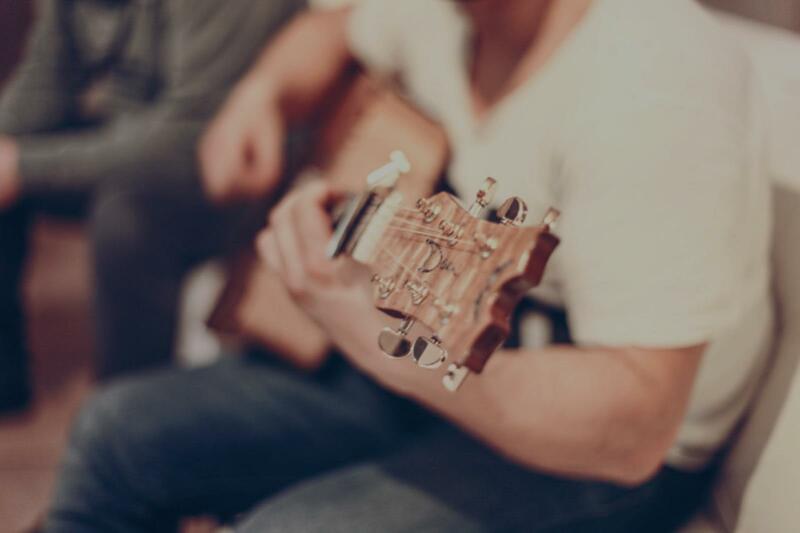 I have been playing since I was a young teen and later studied classical and jazz guitar at the University of Missouri - St. Louis, where I received my Bachelor of Arts degree in Music. Charlie was really nice and look forward to Ashley having more lessons with him. Charlie is an awesome teacher and my 6 year old enjoys the guitar lessons. We like him so much better than the original independent teacher we had, with whom we felt rushed all the time, and we didn't get our money worth. With Charlie is different, he is patient and has the right approach for kids beginners; we highly recommend him to others. Bass guitar is the heartbeat of a song, lots of fun while learning to understand the basics of the instrument. I guide the student through all the steps up to and including composing and playing the bass in a studio recording. A full production of a song of your choice is provided. I teach guitar, piano and voice lessons professionally to all ages and skill levels. In addition, I have recording services available for on-site and remote locations. Production music demos can be recorded for all interested students. I provide audio consulting and coaching if requested. A very positive approach is taken to achieve maximum satisfaction with music teaching, composing, songwriting and production. I have a full background in music theory. Music is the universal language of all times! Dave has helped me move from a guitar player to a songwriter and arranger. We have recorded several songs. Above all else, we have fun. Dave is a very talented musician. He knows how to connect with students and is always willing to try new things. Easy going and informative, I have been coming to Dave for the greater part of 8months. Proffesional bass player, 12 years of playing experience! I am a professional bassist, who also plays piano, guitar (acoustic and electric), and saxophone. I have been fortunate enough to play for some artists here in the US. I have been playing music since I was 8 years old. I grew up playing in the church which only helped further my talents. I play a wide range of genres which include but are not limited to rock, r&b, neo-soul, jazz, gospel, hip-hop, and more. I believe music is fun, it's a form of expression like no other. I am here to help cultivate and mold you just as my teachers have done for me. Can't find a teacher in Satellite Beach, FL? n an easy, fun, and enjoyable atmosphere conducive to learning. Dave transcends all age groups and his approach to each and every class is both easily understood and retained, making the learning experience for the student rewarding! Dave will deliver on the promise and bring joy to you the student, no matter what your skill level may be." Melbourne, FL teacher: Uncle Dave T.
years now, and I am now playing bass guitar in my high school jazz band. He is a wonderful teacher!" nd I hope to play as well as he does one day! He is patient, kind, and elaborate when he teaches. Highly recommended for anyone at any age with any skill level!"